Mini Giveaway: Japanese Kit Kats! The flavours are: Strawberry Cheesecake (ストロベリー　チーズケーキ) from Yokohama, Wasabi (わさび) from Shizuoka, and Eitaro kuro mitsu (榮太樓黒みつ) – black honey – from Tokyo. To enter the competition, all you have to do is leave a comment on this post (comments on Facebook or Twitter will not be counted) by midnight (UK time) on Friday 25th January. When you comment, please include a valid email address (which will not be published) so I can contact you if you are the winner. Please note that this competition is only open to people with UK addresses, and the prize will not be posted to an address outside the UK. The winner will be picked at random and announced next weekend. 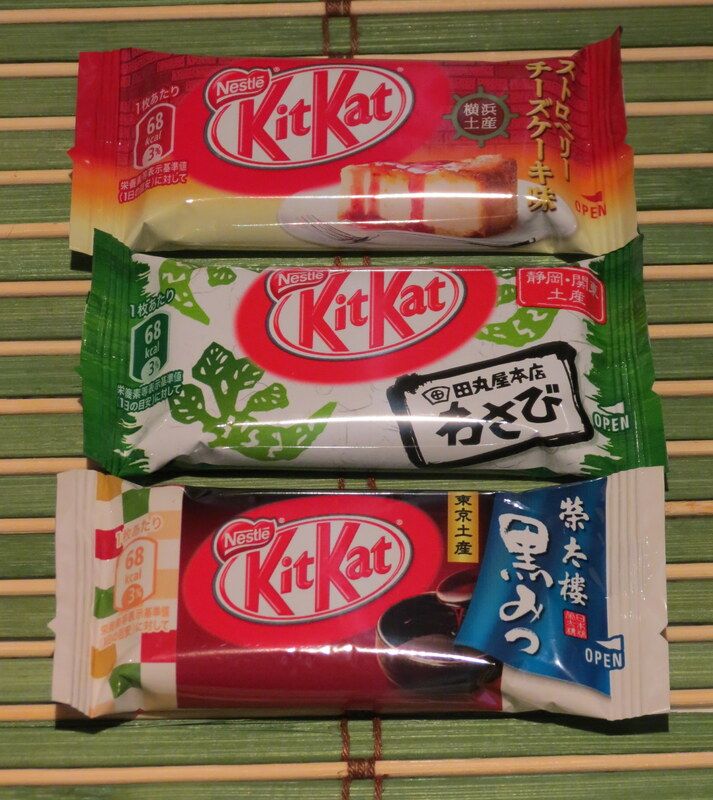 For more about Japanese Kit Kats, please hop over to my other site – Kit Kats! Have a good snowy Sunday! Uh, they all look delicious! What a nice idea to give some away. It’s so hard to find them in the UK. You can only get the non-fun ones. I saw some chunky ones with hazelnut, mint, coconut, and choc fudge flavour. But yours are so much better! I bought the Hazelnut one, though haven’t tried it yet. I saw one Japanese one that had purple imo (?) flavour on someone’s blog. That is one I REALLY would like to try. I like nutty/ earthy flavours. Shame about coconut. Might pick up the choc fudge next time then. I am no fan of mint, at least not in the winter! Ooh yeah, the hazelnut one’s good (oops – I think I’ve tried them all!). Yeah, the beni imo one is really yummy (http://bit.ly/UqRcDv). Ooooh I’d love to try these, my friend bought me a lemonade one, that was quite tasty. Ooh a food competition! I am always hungry for Kitkats but live in Japan so best get down to the combini. Love your blog! こんにちは I’ve just discovered your blog and love it. I’m currently studying Japanese in London so most of the things you post is helpful and interesting, thank you! Not sure about the Wasabi one ! Might have to give that to my son as he is a chocoholic and loves Wasabi ! I’ll eat the other two they sound yummy! Well I’ve never seen these before but they sound delicious. I’m intrigued by black honey Kit Kat. I love trying different flavours!